Home EVENTS MTAANI NEWS Thika’s Uhuru tally improves despite hiccups. 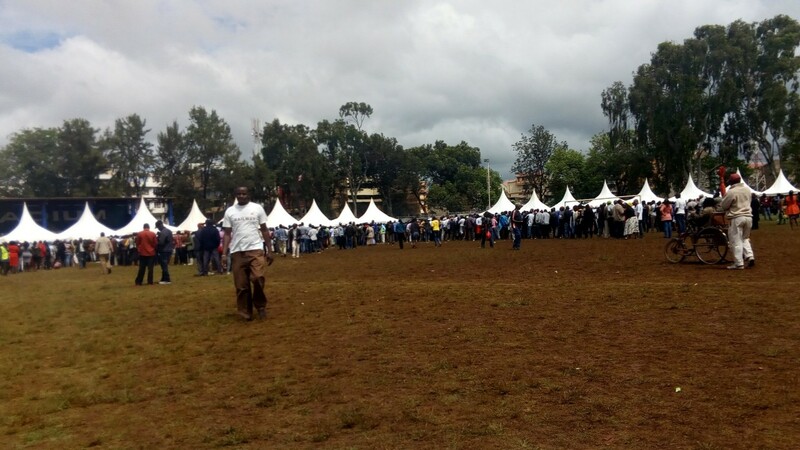 A section of Thika voters at the stadium polling centre lining up to vote on October 26 2017. Thika Town Constituency has registered a marginal improvement in the number of votes cast in October for President Uhuru Kenyatta as compared to his tally on the August 8 2017 despite a number of challenges. In the final tally as announced by the Returning Officer Geoffrey Gitobu at the constituency tallying centre, President Uhuru garnered 99,517 votes out of the total of 102,989 votes cast, equivalent to 98%. His closest challenger NASA’s Raila Odinga garnered 1,243. In the August polls, President Uhuru got 96,856 votes (83.67%) with Raila garnering 18 525 votes (16%). This shows that the president gained 2,661 votes more or 2.5% improvement. The voter turnout in the just concluded election translated to about 70%. All the improvement was despite various challenges that kept quite a number of the constituents away from their polling stations. Heavy rains especially in the morning hours kept very many people indoors, some of whom decided not to get out and vote. There was also a marginal number who were turned away after their names went missing in the IEBC register despite having voted in August. Thika being a cosmopolitan constituency, the diaspora vote cannot be ignored. It is estimated that this vote base constitute between 20% and 30% of the registered voters. A survey of most polling stations predominant of diaspora voters indicated that majority of these voters heeded to their leader’s call for election boycott. However, there was quite a good number of these voters who thought otherwise but were threatened by their peers of dire consequences in case they went out to vote. Our intel revealed that there was a strong warning against anyone who defied these order with some spies sent around the polling centres to check on anyone who dared enter the centres. It was also revealed that their movements were closely monitored to ensure that no one’s whereabouts was unexplained notwithstanding the physical checkup on people’s fingers for any trait of the IEBC mark to indicate that one had voted. Area MP Eng. Patrick Wainaina had established a call centre first to identify all those who failed to vote on August 8 and convince them otherwise come October 26. He also provided various means of transport to the elderly, the sick and all those who had been transferred from other counties to enable them come and vote. These efforts helped to bridge the gap left by the diaspora voters who opted out of the polling centres.